We are excited to be heading to the RDS in Dublin this week for the World Meeting of Families 2018 Pastoral Congress. We are taking part in the ‘Our Common Home” element of the festival. The motivation behind ‘Our Common Home’ is the letter Pope Francis wrote called ‘Laudato Si’, inviting us to think deeply, live wisely and love generously. In this letter he asks that we listen to the cry of the earth and the cry of the poor who suffer the most from environmental destruction. 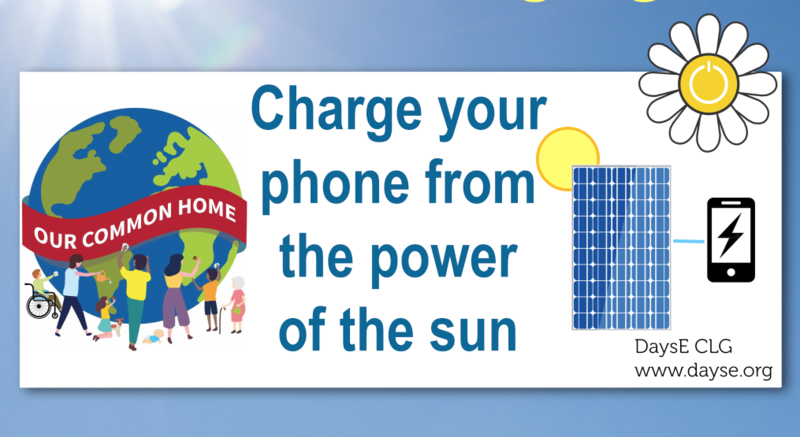 We will have solar phone charging points for use by visitors who have run out of power! DaysE is proud to be promoting our objective of lowering fossil fuel emissions through the use of renewable energy. At the same time, we are focusing on bringing renewable energy to people without access to reliable power of any form. We think these are objectives which align closely with ‘think deeply, live wisely and love generously’. Visit us at the RDS Wednesday to Friday 22nd to 24th August whether your phone needs charging or not! Thanks to WMF2018 for the invitation and financial support. We are delighted that an element of the funding received will go directly to our pilot project in Tanzania – more information shortly. Thanks also to Cultivate for the loan of the Solar Trailer and to Glas Energy for the technical back-up. More information on the programme of events here.